Yoweri Museveni has ruled Uganda for 30 years and isn’t going anywhere. But someday, someone will have to replace him. Will This Woman Replace Uganda’s Strongman? After 30 years of rule and a widely criticized election, Yoweri Museveni doesn’t seem to be going anywhere. But the country is still thinking about who will come next. 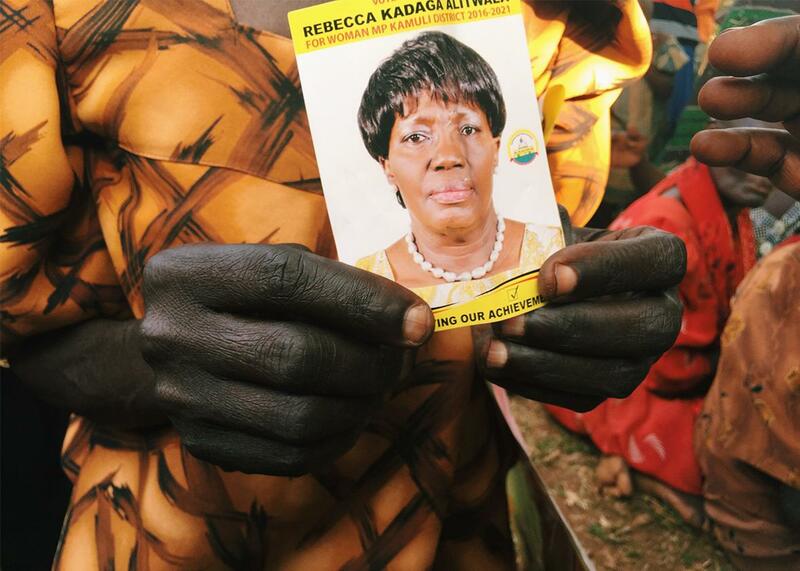 A female villager holds a picture Rebecca Kadaga that she has been clutching throughout Kadaga’s political rally. KAMPALA, Uganda—In early February, about 150 people gathered off the main highway and down a path of bumpy red earth in Kamuli, a rural area a few hours drive from the Ugandan capital of Kampala. Music played from an unseen speaker as two teenage boys wearing tight jeans and bright yellow shirts—the color of the ruling National Resistance Movement—danced provocatively in the middle of a clearing to cheers and whistles. A pickup truck arrived and Rebecca Kadaga, the speaker of Uganda’s parliament, stepped out. She wore a turquoise gomesi, the traditional floor-length gown of the Buganda and Busoga kingdoms of Uganda. The sash of her gomesi was the same bright yellow as the boys’ shirts, and she was wearing a pearl necklace with matching earrings. A red carpet was laid on the dirt, and a padded chair and a table were positioned on top of that. 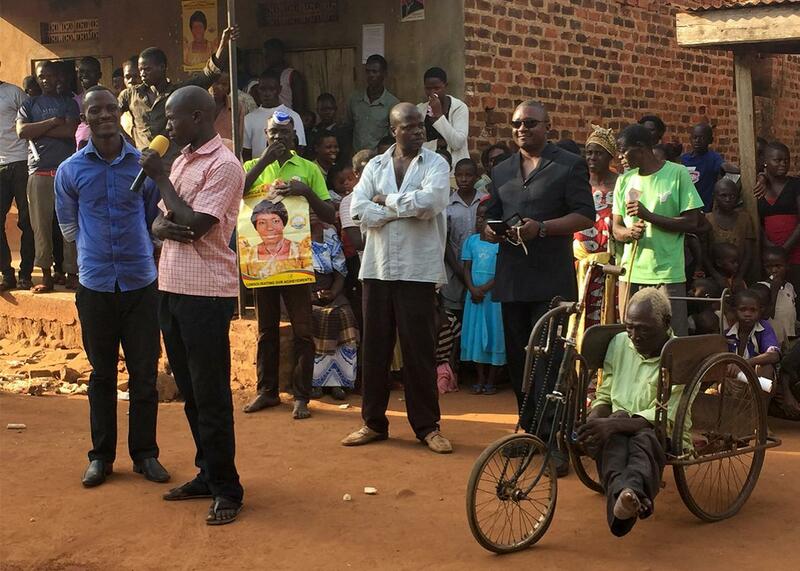 Kadaga sat down, and began another stop on the campaign trail. Museveni, who has been in power for 30 years, won with more than 60 percent of the vote, according to the country’s electoral commission. But the election was riddled with irregularities, including delays in delivering voting materials and allegations of vote rigging and intimidation. The government also shut down access to Facebook, Twitter, and WhatsApp, as well as mobile money services, on voting day. The services remained blocked up to three days after the election. Violent protests were met with excessive police force, and both of the main opposition candidates were placed under house arrest as election results came out. Besigye, who came in second with about 35 percent of the vote, was arrested five times in a little more than a week. Museveni, a 71-year-old former rebel leader, is now entering his fifth term as president under the National Resistance Movement political party. “We don’t believe in term limits,” he told the BBC after this year’s win. He had previously changed Uganda’s constitution in 2005 to abolish the previous two-term limit. Museveni is credited with helping to stabilize Uganda since he first seized power after a five-year guerrilla war in 1986, and has since become one of the U.S.’s strongest allies in East Africa. Despite mounting opposition, it was almost inevitable that he would win the election. But the idea that another person could rise to power in Uganda has long gripped the imaginations of citizens. According to multiple opinion polls over the last few years, one would-be contender is Rebecca Kadaga. As a fellow member of the National Resistance Movement, a presidential nomination for Kadaga, 59, wouldn’t be considered unless Museveni were out of the picture. But her commanding presence in parliament and headstrong leadership has attracted some attention that the former lawyer could be a strong future candidate. She is the first female Speaker in Uganda’s history, and is considered a trailblazer for women in politics. She spearheaded the legal battle against female genital mutilation and fought for equal property rights for wives. But she is also a controversial politician: She is strongly opposed to gay rights and once said that passing Uganda’s internationally notorious proposed anti-gay law would be a “Christmas gift” for the country. 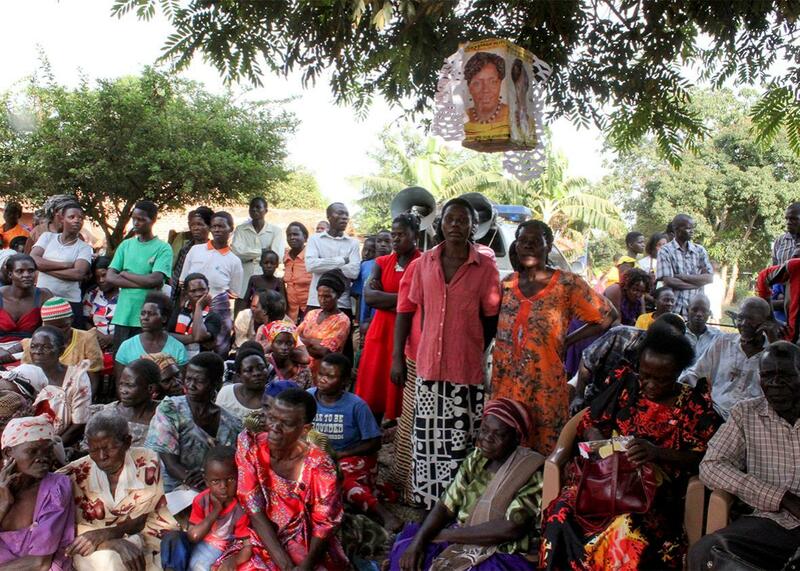 A villager waits for his turn to address Rebecca Kadaga during one of her campaign stops in Kamuli district. The microphone was passed around and other grievances were aired: a promised sewing machine was never delivered, lack of funding for schools in the village. Someone complained that Kadaga’s neglect of the village showed in the lack of yellow National Resistance Movement shirts for constituents. How could they show their support when she didn’t even deliver such necessities? When she finished speaking, some of the women of the village broke out into a song. “Kadaga is number one,” they sang again and again. 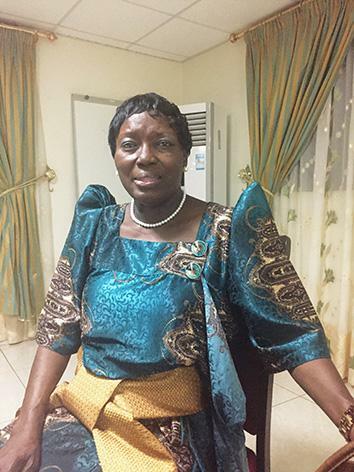 In her home district of Kamuli, Kadaga was running for a seat set aside for female politicians, part of a policy put in place to help more women enter politics. Instituted in Uganda’s 1995 constitution, it states that every district in the country must have a female representative. Most of the women in Uganda’s government were elected through this policy, including Kadaga. Indeed, at the same time Kadaga is heralded for her political prowess, her critics accuse her of relying on affirmative action, the women’s seat, to stay in power. In effect, she repeats history and somewhat undermines her own potential, according to Margaret Semtamu, the executive director of the Uganda Media Women’s Association. “How can you ask Museveni to go when you also haven’t left your seat?” she said. Villagers gather in Kamuli district, in eastern Uganda, to welcome Rebecca Kadaga as she campaigns for the women’s seat of the district. Enabling female parliamentarians to accomplish this is difficult, though, said Irene Kwaga, head of policy at the Uganda Law Society. And that’s because of the design of the affirmative action policy. The women’s seats are to represent districts, an area that encompasses three constituencies; the other, open seats that both men and women can run for in parliament are to represent individual constituencies. When women are given the same amount of funding as men to represent this larger region, both she and her resources are inevitably spread thin. “And then she ends up turning up as incompetent,” Kwaga said. Rebecca Kadaga pauses for a photo during an interview at Century Hotel Limited, a hotel she had constructed in her home district of Kamuli. The Century Hotel, where I interviewed Kadaga, is an accommodating place just a few kilometers away from the campaign stop. Kadaga invested 3 billion shillings (about $900,000) of her money to have the hotel built for Kamuli district in 2014. * Several members of the parliamentary communications office spent about half an hour arranging the camera and equipment ahead of our interview; they were filming it for their own records. Reporting for this story was supported by the International Women’s Media Foundation’s African Great Lakes Reporting Initiative. Sonia Paul is a 2016 Fellow to Uganda. *Correction, Feb. 27, 2016: This story originally misstated that 2 million shillings was close to $200 and that 3 billion shillings was about $892,000. Two million shillings is close to $300, and 3 billion shillings is about $900,000. (Return.) It has also been updated to include the name of disabled village representative Mwase Agwanaatyo.